Ontario is tilting at the wrong windmills is a strong editorial from the Globe and Mail; "...cost is climbing, as expensive wind and solar power is brought into the system, as demanded by Ontario’s Green Energy Plan..."
Ontario tilts against wind turbines as costs spiral, by the Star's Martin Regg Cohn, showed signs of intellectual, if not emotional, life; "While the NIMBYists beat their breasts, the bean counters took their eyes off the turbines. Politics trumped economics." There are only two wind generators on the northeast and northwest regions: Prince Farm is just outside of Sault Ste. Marie (which is in the northeast zone), and Greenwich is north of Lake Superior, in the northwest zone. 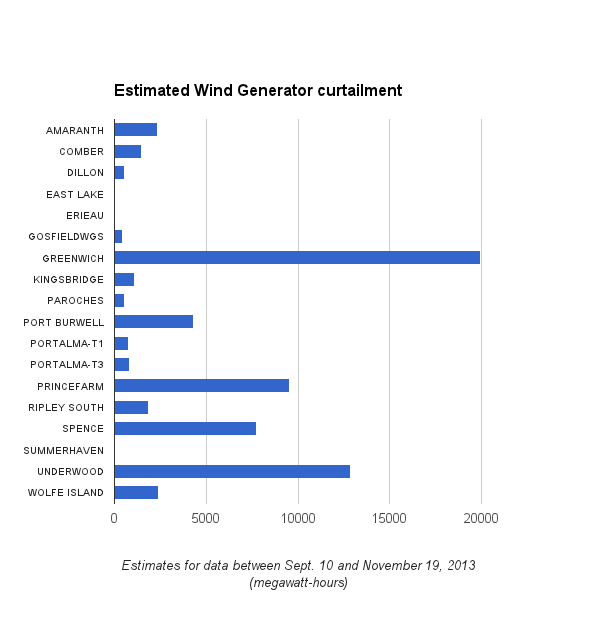 With a trip to my database to pull my estimates on Curtailment of electricity supply in Ontario, I found that between wind becoming dispatchable and home heating season kicking in, there was one site far more likely to be curtailed than all others - and it's the northwestern Greenwich site. Over the period noted in the graph the estimate is that 35% of Greenwich's potential generation was curtailed. Prince Farm is near the top too, but the second place, over near Kincardine and Huron's shore, deserves a quick mention. Underwood was the subject of Vampire Turbines in July where I demonstrated it was likely drawing power off the grid over 25% of all July hours. It's a particularly lousy site in terms of production that's capable of meeting Ontario's demand, but it's right on a very major transmission line. If this site is ever constrained it's a big problem in terms of additional, planned and contracted, growth for the area. One of Samsung's few projects, Armow, is set to be plunked right by the Underwood site, where it will join a number of other Ontario industrial wind projects in threatening a municipal airport. In Thunder Bay the Big Thunder wind park has always had some strong local opposition, and recently Fort William First Nation Chief Georjann Morriseau has been aggressively questioning the project; a project few want, and none need. The northwest zone did have 2 coal generating stations, but it's been years since they ran much at all. Nonetheless it was felt, in Toronto, that not running on coal was bad, so they are being converted not to run on biomass. The reality is that wind turbines built in the constrained northwest will have, essentially, no coal or gas-fired generation to displace. Shortly after the current Premier acquired the position, by being selected leader of her party, wind generators dropped an appeal on curtailment policies they were preparing to take to the Ontario Energy Board (who should have refused to hear it! ), because an agreement was reached with the new government. Prior to Wynne's reign, and subsequent gift of payment for potential supply the grid cannot accommodate, the industry was speculating about a great deal of attrition in the remaining ~3,750MW of contracted capacity - meaning much of that contracted capacity was unlikely to get built. The estimated cost of the curtailments graphed above is $8.3 million (66731 MWh at $125/MWh). Curtailments should be rare until the spring season, and then they are likely to soar much higher than the totals from this fall; as suppliers now are assured of payment for unnecessary suppply, total industrial wind capacity is expected to more than double in the next 18 months. In near future, curtailment costs are likely to balloon. The northeast region may soon follow the northwest in achieving high curtailment levels. The Lake Superior Action-Research-Conservation (LSARC) has an appeal of the Goulais project beginning next week, and another Algoma region project is proposed for some of the country's most iconic landscapes. Resistance to projects, and all appeals, are being fought largely by what the Star's Regg Cohn refers to as NIMBYs. The term was once an acronym for Not In My Back Yard - although that doesn't seem to be how the Star's Queen's Park columnist uses it in implying people beating their chests off in the wilds of southwestern, eastern, and northern Ontario prevented the accountants of the lesser Toronto Area from counting. The counting was going fine. Bean counters are very active in the opposition, and, working with reality, have managed to prevent the government from being so stupid as to contract more industrial wind generation since 1,018 MW of proposals were offered contracts on July 4th, 2011. The rate of growth in construction of contracted projects has also been slowed considerably by these NIMBYs. Now that even the government acknowledge a need to curtail growing supply, the NIMBYs, along with their bean counter and realists allies, have been vindicated. Accounting for the cost of dumping excess supply, and the cost of curtailing supply, and the cost of spilling water in order to purchase more expensive supply, is not a task that allows for precision, but it's known the entire province has benefitted by the actions of anti-wind NIBMYs, and their allies. Prior to the explosive rate hikes of 2013's late spring and summer (likely driven by solar projects that weren't opposed by NIMBYs), rate escalation, and built wind capacity on the grid, were both tracking below expectations. But the NIMBYs did not benefit from their fights any more than other Ontarians; they have lost all fights for their own back yards, except for one, and that one is being appealed by the project proponent and their Torontonian Premier. If it is now fashionable to agree with the arguments of the NIMBYs and their allies, it should also be time to respect them/us.